"These Martyrs contested for piety's sake in the year 524 in Najran, a city of Arabia Felix (present-day Yemen). When Dhu Nuwas, ruler of the Himyarite tribe in south Arabia, and a Judaizer, took power, he sought to blot out Christianity, especially at Najran, a Christian city. Against the counsels of Arethas, chief man of Najran, the city surrendered to Dhu Nuwas, who immediately broke the word he had given and sought to compel the city to renounce Christ. 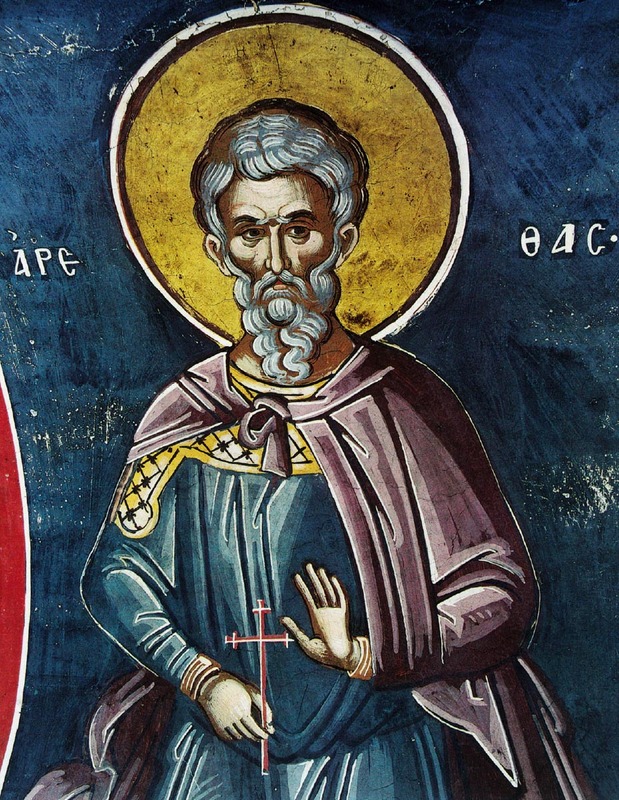 Led by Saint Arethas, hundreds of martyrs, including women, children, and babes, valiantly withstood his threats, and were beheaded and burned. After the men had been slain, all the free-born Christian women of Najran were brought before the tyrant and commanded to abjure Christ or die; yet they rebuked the persecutor with such boldness that he said even the men had not insulted him so contemptuously. So great was their faith that not one woman was found to deny Christ in all Najran, although some of them suffered torments more bitter than most of the men. In alliance with Byzantium, the Ethiopian King Elesbaan liberated Najran from Dhu Nuwas soon after and raised up churches in honour of the Martyrs. Najran became a place of pilgrimage until the rise of Islam a century later. 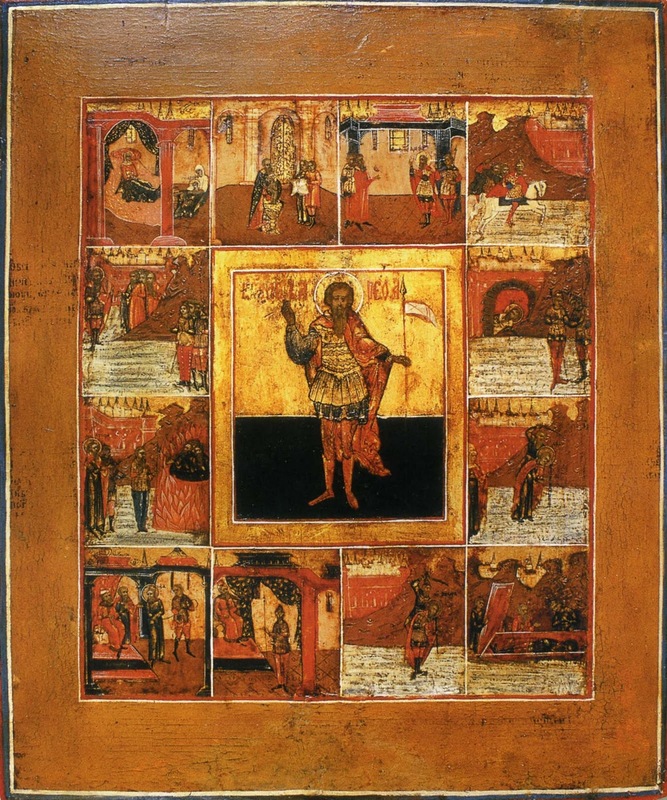 At the end of his life King Elesbaan, who was also called Caleb, retired into solitude as a hermit; he sent his crown to Jerusalem as an offering to the Church of the Holy Sepulchre. 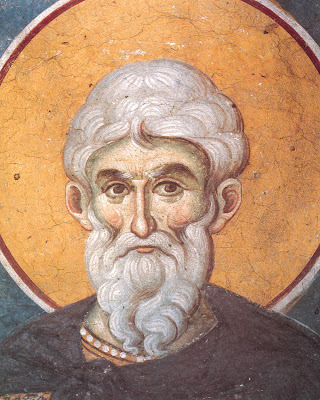 He also is commemorated on this day as a saint. 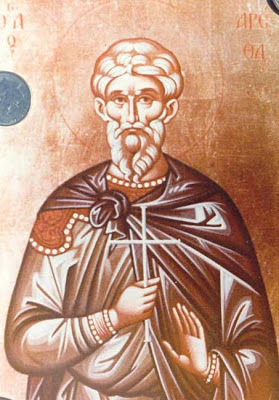 Saint Arethas' name in Arabic, Harith, means "plowman, tiller," much the same as "George" does in Greek." 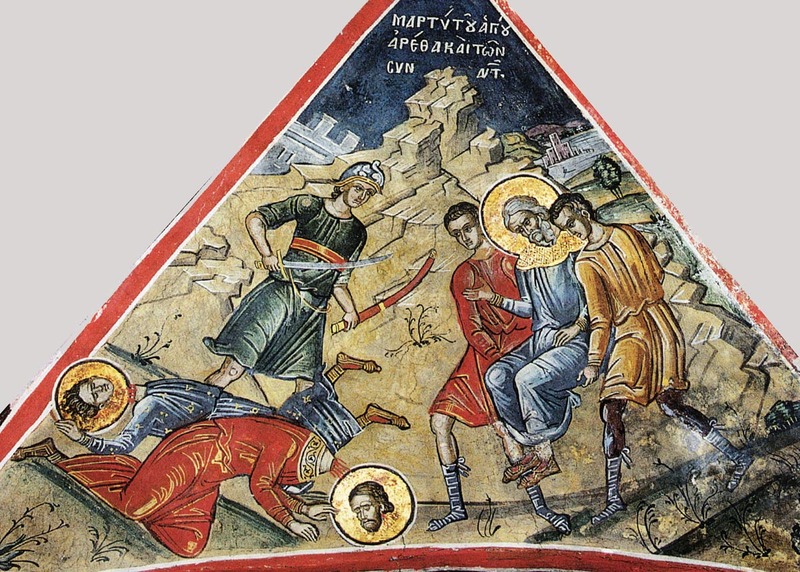 "In his 524 [AD] letter describing the Najran persecutions in detail, the West-Syrian debater Simeon, the bishop of Beth Arsham describes how female martyrs rushed in to join 'our parents and brothers and sisters who have died for the sake of Christ our lord'." "Simeon of Beth Arsham's Second letter preserves yet another memorably gruesome episode. After seeing her Christian kinsmen burned alive, Ruhm, a great noblewoman of Najran, brings her daughter before the Himyarite king and instructs him: "Cut off our heads, so that we may go join our brothers and my daughter's father." The executioners comply, slaughtering her daughter and granddaughter before Ruhm's eyes and forcing her to drink her blood. The king then asks, How does your daughter's blood taste to you?" The martyr replies, "Like a pure spotless offering: that is what it tasted like in my mouth and in my soul."" What totaly and unutterable love for Christ! May we be able to emulate their witness, their zeal and their love for Christ in our lives, even if only in a very small way. Holy Saints of Christ, intercede for us! Ευσεβεία εμπρέπων τη αθλήσει δεδόξασαι, την των Χριστοκτόνων κακίαν καθελών τη ενστάσει σου, διό και προσενήνοχας Χριστώ, Μαρτύρων αρραγή συνασπισμών, ώσπερ θείος παιδοτρίβης και οδηγός, Αρέθα παμμακάριστε. Δόξα τω δεδωκότι σοι ισχύν, δόξα τω σε στεφανώσαντι, δόξα τω ενεργούντι δια σου, πάσιν Ιάματα. You were glorified magnificently by your struggle for piety, and through your steadfastness you deposed the evil of the Christ-killers, and you therefore offered to Christ immovable ranks of Martyrs, as a divine teacher and guide, O all-blessed Arethas. Glory to Him Who gave you strength, glory to Him Who crowned you, glory to Him Who grants through you healings for all.